As wedding planners, we love a good love story, and these two have quite the special tale. Taylor started working with us at Charleston Street in late 2017. A few weeks into her time here she got engaged! Taylor and Peyton are two high school sweethearts who reunited later in life. It was one of those "when you know you know" moments that warms your heart when you hear the story. They are such a sweet couple, and we were so honored to be asked to be a part of their day! Our Taylor loves her blue, specifically that perfect shade of french blue. It's her absolute favorite, so we knew it had to be included! And that we did! From the bridesmaids dresses, to the linens, to the flowers, to the paper goods. However the bridesmaids' bouquets were composed of peonies, garden roses, hydrangea, dusty miller, and gorgeous hosta leaves in shades of pink and green to complement the blue of the Bill Levkoff dresses. Taylor's bridal bouquet was a stunning compilation of various kinds of peonies and ranuculus, with just a touch of dusty miller. It complemented her Anne Barge gown perfectly. The wedding took place at the end of June (just days before the 4th, as you will see below!). The ceremony was held at St. Augustine's Episcopal Church, a sanctuary that has significant meaning and history to Taylor's family. And the reception was held at the beautiful Augusta Country Club. 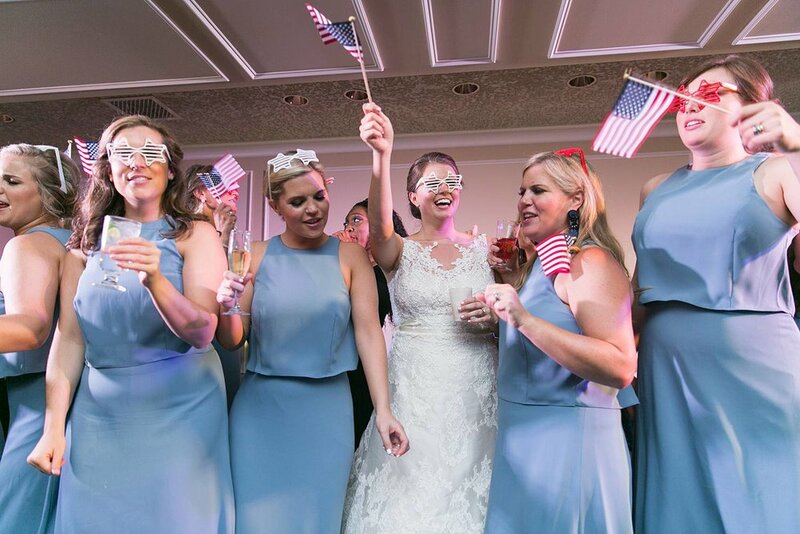 We had an all-star vendor team including Ashley Seawell Photography behind the lens, Cucumber & Mint for the ladies' hair & makeup, and Rhythm Nation keeping guests dancing well into the night!